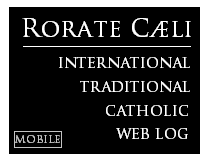 RORATE CÆLI: UPDATE: Volpi must pay by March 3, and issue press release through Italian news agencyBREAKING: Franciscan Friars of the Immaculate Commissioner Volpi admits guilt of defamation and liesMust pay 20,000 Euros, make public apologyWill Pope Francis allow what's left of the FFI to survive? Will Pope Francis allow what's left of the FFI to survive? UPDATE: Corrispondenza Romana has a copy of the court record and is reporting that Fr. Volpi has a deadline of March 3 for paying the damages to the Manelli family and making public apologies. In addition to the numerous ways he must publicly apologize, listed in our original report below, he must also now issue a press release distributed through AGI (the Italian news agency). Corrispondenza Romana also asked if Fr. Volpi will resign. We believe there is a more critical question: Why hasn't Pope Francis publicly fired him and ended this unjust and unwarranted commissioning that he himself started? The chickens have come home to roost for Pope Francis' Apostolic Commissioner of the Franciscan Friars of the Immaculate (FFI), Fr. Fidenzio Volpi, and possibly just in the nick of time. 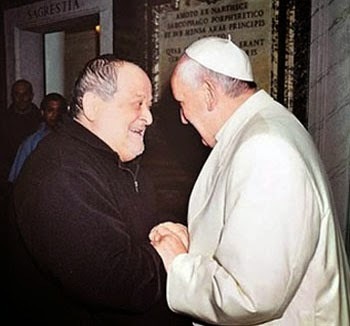 Volpi meets Pope Francis the day the FI seminary was closed. Rorate Caeli contributor Francesca Romana has translated the first report from Chiesa e post concilio reporting that Fr. Volpi will pay the family of Franciscans of the Immaculate founder Fr. Manelli a large cash sum for his "defamation and lies" and make public apologies on all websites he runs and in a letter to all FI friars and nuns. For regular readers of this blog, you know that Fr. Volpi was brought in for just one reason: to crush one of the fastest-growing, traditional-minded religious orders in the world -- but not on his own: as he admitted in the past, at least in his words, he was "specifically ordered by the Vicar of Christ," Pope Francis to carry out his mission. 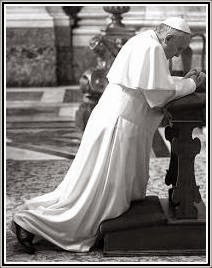 Will Pope Francis now finally rein this man in and force his boot off the throat of an order that only wants to serve God as the saints have all served Him for two millennia? And will Pope Francis finally end this unjust commissioning and allow the poor friars who have had to flee the grip of this cruel man to return to their sworn vows and live out the remainder of their vocations in peace? We pray to hear in the affirmative soon. Is this a fruit of the Rosaries and fervent prayers at Santa Maria Maggiore? For the moment the only source is Don Camillo (a priest blogger) whom I know is close to the Manelli family; for this reason I trust the source and thank him for the information. Original text [click] here. Is the justice of men more efficient than ecclesiastical justice - of the new-church that is - which seems to have just discovered Mercy only today? I’m wondering though, why Don Camillo can attribute what happened, to Benedict XVI, seeing that the Decree of the Congregation for the Institutes of Consecrated Life and Societies of Apostolic Life, wherein the Commissioning of the Franciscans of the Immaculate is laid out, with the subsequent destitution of the Founder and General Minster of the religious Institute (and its Council), is dated 11th July 2013. The Decree, signed by the Cardinal Prefect, João Braz de Aviz and by the Archbishop Secretary, José Carballo, OFM, deprived the Superiors of the Franciscans of the Immaculate of any authority, entrusting the government of the Institute to an "Apostolic Commissioner”, Father Fidenzio Volpi, a Capuchin. A decree, what’s more, that doesn’t mention any misdeed, nor acts expressly and directly against the good of the Religious Institute. And with no reference to any question or motivation that regard properly faith, morals or discipline. And it was confirmed in writing by Pope Francis, which made any recourse to appeal not possible. I have never involved myself too much regarding the situation of the Franciscans of the Immaculate, but a sentence emitted by the Mediation Organism (Organismo di Mediazione forense) of the Roman Tribunal [Tribunale civile di Roma] on the 12th of February is just too juicy! […] Well then, for these lies Father Volpi, [after] negotiating with the entire Manelli Family, whose honour was damaged, and consequently having admitted the felony [reato] of defamation and lies [menzogna, also: falsehood] on February 12th 2015, as fair compensation, will have to pay 20,000 Euros to the Manelli Family, plus all legal expenses, the publication of a public apology on internet sites run by him, as well as circular letters to all of the friars and nuns.